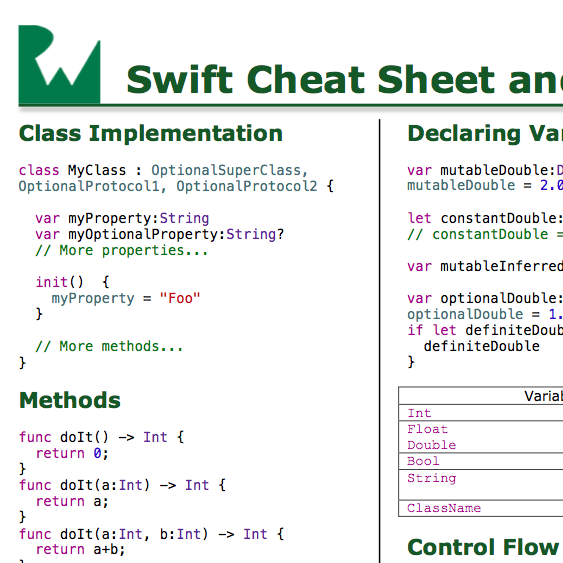 Download a handy 1-page PDF Swift Cheat Sheet and Quick Reference! Update 8/4/17: Updated for Swift 4 and Xcode 9. Sometimes when learning a new language it’s handy to have a cheat sheet as you are getting used to syntax. You can also download a Swift 4 playground with the examples from the cheat sheet. Let me know if you have any comments/suggestions on how to improve this. I’ll be updating this periodically as Swift changes. Want to learn more? Check out out our new Swift 4 books – covering everything you need to know about Swift 4, iOS 11, and more!